‘Tis the Season to be Preggers GIVEAWAY « Are You Preggers? That’s right, you heard it right, we’re having a GIVEAWAY! We’re spreading holiday cheer, by giving away an awesome prize to one momma-to-be a week for four weeks! Yep, that means four giveaway, and 4 winners (or more! ), and 4 prizes! Starting today, we’ll announce a giveaway every Monday for the next four weeks! And the best news? You can enter each giveaway up to 7 times! 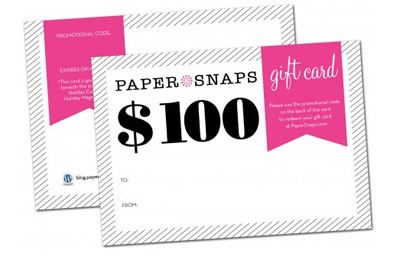 SO… this week’s giveaway is …… a $100 gift card to PaperSnaps! PaperSnaps is a high quality, unique, and stylish shop providing customizable cards and stationary. They’re a great source for birth announcements and holiday cards. We love PaperSnaps for SO many reasons. First, they offer a wide selection of custom cards – they’re all so cute, it’s hard to pick a favorite. They also pride themselves on doing what’s right. PaperSnaps will do everything they can to make sure you are 100% satisfied with your order. We LOVE that! To enter, head over to our entry form, fill out it out, and hit submit! Want to be entered up to 7 times?! We thought so! Just like Preggers on either Facebook, Twitter, or Pinterest, like PaperSnaps on either Facebook, Twitter or Pinterest, or blog about the ‘Tis the Season to be Preggers Giveaway! It’s that simple. The PaperSnaps giveaway winner will be announced 12-3-12, so what are you waiting for?! Get entered now! And, be sure to check back every Monday for a new giveaway!